I love smelling the fragrant aroma of rosemary, freshly picked from my little Montreal garden, a joy of summer spice, but what does it tell us about concussions? Is it possible that breathing in a specific scent can actually boost brain performance? Amazingly yes, according to Dr Mark Moss, from a recent article published in Therapeutic Advances in Psychopharmacology on February 24, 2012. Dr Moss has been studying aromas for over ten years. He studies specifically how aromas can get into the blood then, once bound find their way into the brain across the blood-brain barrier. Working with co-investigator, Lorraine Olivier they made their observations with 20 healthy volunteers who participated in their study by performing mental tasks, serial subtractions plus visual information processing. The testing cubicles were infused with the aroma scent of the 1,8-cineole, which is from the cooking herb, rosemary. Translated from Latin ros marinus, as, dew of the sea the evergreen like leaves of rosemary are used to flavor roast turkey, chicken, pork and lamb. The mint family spice originated and thrives from the dry climate typical of the Mediterranean region to flavor a wide range of different cultures favorite foods, even our own family’s favorite Christmas stuffing. The researchers set out to correlate the serum (blood) levels of 1,8-cineole with the thinking performance tabulating the number of correct responses with corresponding reaction time for each task. 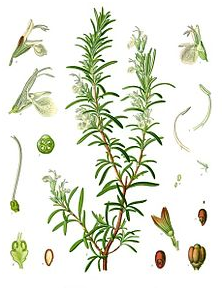 Different absorption levels of the rosemary aroma were assigned for varying exposure times, in effect changing concentration exposure to the herb. According to the researchers, the tested serial subtraction tests, ‘assess continuous working memory, arithmetic processing, and central composition.’ Blood serum levels of the 1,8-cineole, samples taken after the test, correlated with the performance outcome of their subtraction test but not with the rapid visual information processing task, which is an assessment of sustained attention and central executive functioning. The researchers also evaluated the mood of the volunteers before and after their testing, remarking speculatively in their conclusion, that positive mood can influence outcome by improving the cognitive performance tested but simply arousing mood cannot, with no effect on alertness attempted with forced attention Their speculation says a lot about being passionate about what you do certainly helps, doesn’t it? So taking their summary that, ‘compounds absorbed from rosemary aroma affect cognition and subjective state independently through different neurochemical pathways,’ their rosemary aroma research poses some intriguing questions. Specifically like comments concerning the ravages of aging or more particularly, premature aging-like decline in the brain, which involves the defined progression of Alzheimer’s disease. 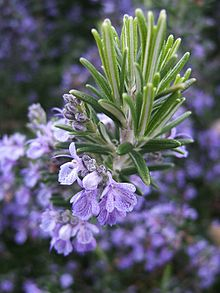 Comments from Dr Ilkay Orhan working at Gazi University, Ankara, Turkey points to the ability of rosemary using one of its essential oils, 1,8-Cineole to inhibit a key enzyme involved in the pathogenesis of Alzheimer’s disease. Rosemary aroma appears to temporarily mimic the preferred prescribed drugs used for the treatment of Alzheimer’s disease, with its ability to inhibit acetylcholinesterase, the targeted enzyme. Now things gets interesting, let’s follow the scent. More rosemary aroma observations from 2003 involving both the University of Pakistan in Karachi, Pakistan and the National Academy of Sciences of the Republic of Kazakhstan in Karaganda, Kazakhstan by authors: ZK ASanova, EM Sulimenov, GA Atazhanova, AD Dembitskii, RN Pak, A Dar and SM Adekenov who studied the essential oils from levant wormwood. In 1884 it was established that the main component is 1,8-cineole. The authors tested a variety of effects of 1, 8-cineole on mice including comparable reductions to acetic acid induced convulsions with similar analgesic induced effects compared to aspirin at the same dosage for both at 100mg/kg. Mice melanoma cells and carcinoma cells from mice were inhibited by 1,8-cineole at a concentration of 1 x 10-2 (minus2) inhibited their growth by 95%. If rosemary gets bound into blood, does it affect blood pressure? I cite from Cardiovascular Effects of 1,8-cineole in Normotensive Rats published in the Canadian Journal of Physiological Pharmacology in 2002 by S Lahlou, AF Figuereido, PJ Magalhaes and JH Leal-Cardoso, Universidade Federal de Pernambucco, Recife, PE, Brazil. These authors reported 1,8-cineole vasodilatory effects directly onto vascular smooth muscle when giving bolus intravenous injections by eliciting a dose-dependent decreases in mean aortic pressure, dropping blood pressure, creating hypotension in their rats. Are you still with me? Remember I stated this gets interesting at the beginning? Here’s why, I think so. It’s no good waiting for Alzheimer’s to take its full dementia effect and then start trying to stall the sweep of the dementia disease. What about early detection for Alzheimer’s, what’s out there? In a study of patients with very mild Alzheimer’s disease as reported March 8, 2012 at http://www.medscape.com/viewarticle/759975 concerning recently completed work by lead author Dr Rawan Tarawneh along with Dr David Holzman published by Megan Brooks for research performed at Washington University School of Medicine in St-Louis, Missouri, published in Neurology March 6, 2012 entitled A New Biomarker of Cognitive Decline in Alzheimer’s. ‘ Baseline levels of visinline like protein 1 (VLIP-1) measured in cerebrospinal fluid (CSF) strongly predicted the rate of cognitive decline over roughly 3 years. Memory and other cognitive abilities declined faster in patients with the highest level of VILIP-1 . a neuro calcium-sensor protein that is a sign of neuronal injury.’ Notice the critical term cited is neuronal injury with free VILIP-1 being measurable in the blood, as the new blood biomarker. What is VILIP-1, where is it, what does it do really? But before reacting with some responses to VILIP-1…. What is a good indicator of early symptoms for tracking Alzheimer’s disease? Let’s follow the scent, again. The scent of smell is also an early indication of the impending downgrade that leads to Alzheimer’s dementia. It’s now the scent of the neurobiology of disease, how Alzheimer’s disease has a unique vulnerability within the olfactory system, which provides, ‘a quintessential translational tool for understanding the synaptic dysfunction and pathological progression of the (dementia) disease.’ Quotation is from The Journal of Neuroscience 2 November 2011, 31(44): 15962-71, Sensory Network Dysfunction, Behavioral Impairments, and Their Reversibility in an Alzheimer’s Beta-Amyloidosis Model authored by DW Wesson, AH Borkowski, GE Landreth, RA Nixon, E Levy and DA Wilson. Here is their entire abstract, I think it’s brilliant work, bravo guys and girls! “Using the Tg2576 mouse model of B-amyldosis, we show the aberrant, hyperactive olfactory network activity begins early in life, before detectable behavioral impairments or comparable hippocampal dysfunction and at a time when amyloid-B (AB) deposition is restricted to the olfactory bulb (OB). Hyperactive odor-evoked activity in the piriform cortex (PCX) and increased OB-PCX functional connectivity emerged at a time coinciding with the olfactory behavior impairments. This hyperactivity persisted until later in life when the network converted to a hyporesponsive state. This conversion was AB-dependent, because liver-X receptor agonist treatment to promote AB degradation rescued the hyporesponsive state and olfactory behavior. These data lend evidence to a novel working model of olfactory dysfunction in AD and, complimentary to other recent works, suggest that disease-relevant network dysfunction is highly dynamic and region specific, yet with lasting effects on cognition and behavior.” WOW SO COOL! Where do you look for this to happen as the sense of smell downgrades in early Alzheimer’s disease? You look where the rosemary scent gets interpreted within the olfactory network, with its unique vulnerability, within olfactory neurons. If this unique vulnerability happens with the development of Alzheimer’s disease, do long time football multiple concussion injured players exhibiting early dysfunctional Alzheimer’s dementia also suffer olfactory damage as an early indicator? I started with smelling the rich summer scent of rosemary to reveal detection of early Alzheimer susceptibility then veering toward the beginning of a screening test for concussions. The sense of smell is the least funded of all the sensory based research, behind vision, behind hearing, behind taste, behind pain. Surprisingly the scent signals are telling us about the unique vulnerability of specific brain zones especially for early detection of Alzheimer’s disease. Instead of smelling salts to arose somebody after a concussion we should be offering a UPSIT sniff and scratch test to compare with their pre-injury smell function UPSIT test, potentially confirming the diagnosis of a concussion. The validity of the olfactory concussion comparison test is a project waiting to happen. I came across a word yesterday, ubuntu.Which is roughly translated as: to start the sharing of knowledge to everybody’s gain. That is the best I can say about what I am trying to do with writing about concussions. They can happen anywhere to anyone. I believe we can start a better awareness of their biology. I believe one day in the middle of my heart we can grasp the essence of the damage trail with concussions about what happens in the brain, where it happens. I believe we can jam it -influencing, coaxing to slow it down to reestablish a balance within the brain. There is a treatment for concussion -I can feel it in my gut. I just hope I see the day that intervention comes to pass.